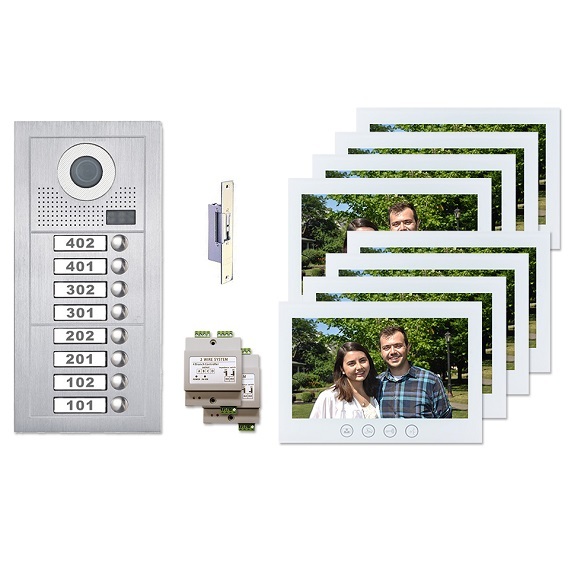 At BEC Integrated Solutions we offer multi-tenant video intercom systems, also known as apartment video intercom systems, which are affordable security options for apartment buildings, condominiums, or any other type of multi-tenant building. These systems use CAT5 cables and are ideal for either small apartments with few tenants or large buildings with high traffic. The multi-tenant video intercom system can be installed and used for access control of gates or doors of any type of building. The video feature of our apartment video intercom system allows not only voice call options, but also video monitoring from a remote location. This feature adds to the video and access control security solutions of any facility. Our multifamily video intercom systems service apartment buildings ranging from two tenant units to 300 tenants per building. No matter what size system is needed, simply answer a few simple questions using our free INSTANT quote tools and build your own system in minutes. Get started now! Your proposal is just minutes away. Select one of our many video intercom systems pictured below to get started building a system tailored to your project needs. 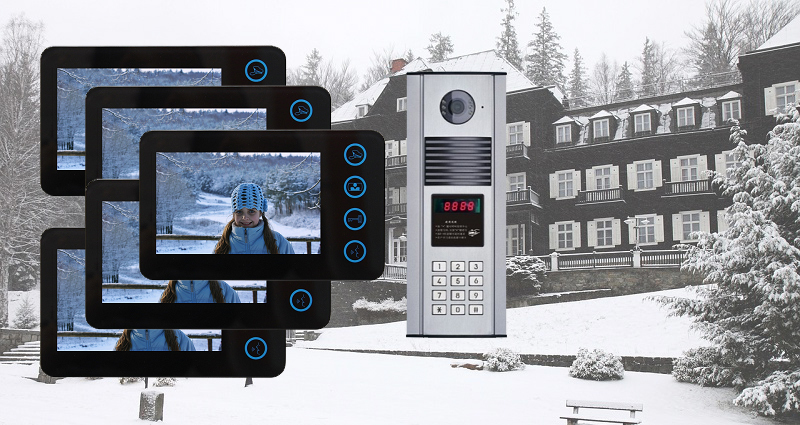 Our NT Series IP-based video intercom system is an all-encompassing solution for any property, residential or commercial. With features that dip into the realms of video surveillance, access control, call forwarding, and even home automation, this is a complete and expandable system with a price point to accommodate any budget. The BEC Building Video Intercom System has numerous features to consider when choosing which product is best for your security needs. 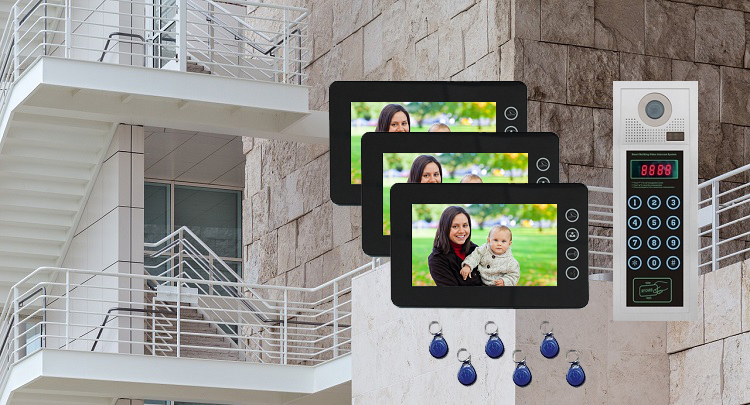 Up to 300 video monitors can be installed using one of our multi-tenant video intercom systems. We offer color video monitors with screen sizes from 4.6 inches to 10 inches. Our multi-tenant video intercom cameras have infrared night vision capabilities for 24 hour security. 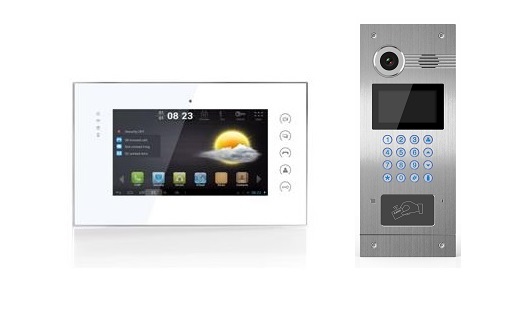 Each door unit contains a card reader for quick entry using an access card or a key fob. Entry can also be granted using an access code on the keypad. The door entry units also have 24 VDC electric strike locks wired to the entry unit without the need for an extra power source. Our multi-tenant video intercom system door entry units have many capabilities that will eliminate your security concerns. The MT Series Video Entry Intercom System requires a total of two wires to each video monitor. This even includes power to the monitor. The video intercom and power is supplied to the video monitors with only two conductors. Wire size should be a minimum of 18 AWG. With these wiring requirements this system may be suitable as a replacement system for some older multi tenant buildings and apartments.